Three agents gave us their opinions of value on our home. There are substantial differences. What should we do? Many real estate agents overlook the best practices for evaluating homes. Here are some tips to help you get to the right offering price. Reader Question: We are going to sell our home. We asked three agents that were recommended to us by friends and family to look at our home to establish our home’s listing price. We wanted several opinions on our home’s value. Each one of them has a different opinion, and there is a sizeable difference in their estimates. They each provided many comparable sales and homes for sale, which we do not feel qualified to judge. We don’t want to leave equity on the table, and we don’t want to overprice. What should we do? Monty’s Answer: You are on the right track. Had you only asked one agent, there would be no question as to which opinion is the best. While it takes more time and effort on your part to ask three agents, you are substantially increasing the odds of avoiding lost equity and overpricing mistakes. My experience is that the bulk of real estate agents nationwide do not utilize standard appraisal protocols. To hand a home seller a stack of comparable sales data and then declare that your home is worth “X” without detailed justification increases the chances of overpricing or losing equity. There are two missing pieces in their current approach. The first missing piece is that you want their opinion on three homes in the stack that are the best comparables. It isn’t your job to sift through the stack to figure this out. 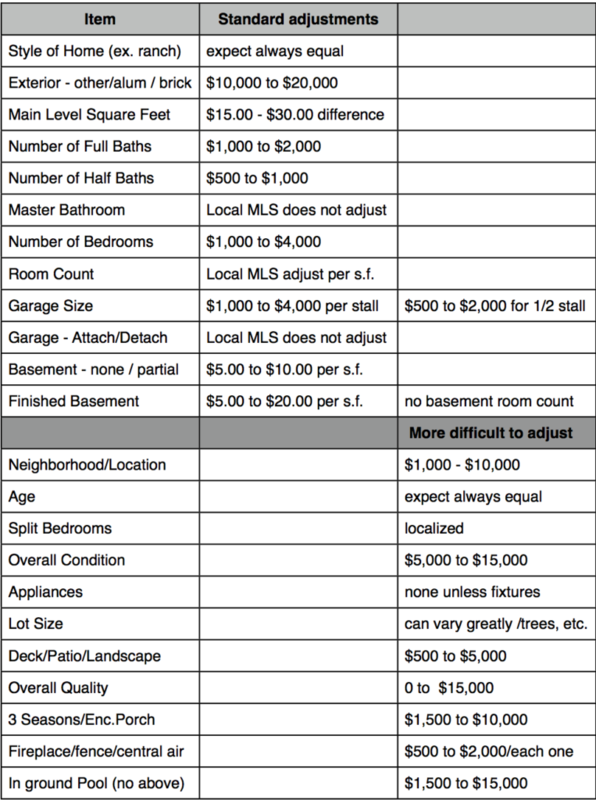 The second missing piece is that you want them to account for the differences between each of the comparables they chose and your home, and put a dollar value on those differences. Most every home that is similar to your home will possess some features (or lack those features) that creates (or detracts from) value. Without taking the time to make these adjustments, homes that appear similar can still be many thousands of dollars apart. For example, the physical size of two homes as determined by square footage can be very similar. The cost to produce the physical size varies substantially. A ranch style home on one floor is far more costly to construct than a two-story home of similar size. Why? The basement excavation cost, roof structure, the foundation, and the basement walls, which are some of the more expensive components, are considerably less costly to produce because the two story home is stacked. These components cost less in a smaller footprint. Always check to see the styles match. An appraiser examines the cost approach as a major factor in determining a home’s value because cost sets the upper limits of value. In most markets, few people would buy a pre-owned home if they could purchase a brand-new home for the same price. Many features must be reviewed and considered for adjustment in every comparable chosen. Go back to each agent. You are still considering them, but there are substantial differences in the pricing, and you are not comfortable. Tell them what you need to help clarify these differences. You do not want to share the pricing between agents. Ask them to deliver an updated estimate that contains only three comparable sales. Instruct them to pick the best comparables because they are the experts. Ask them to place a dollar value on the differences between the features of each comparable they chose and your home. If they are unclear about your request, share the ranch vs. two-story example above. Hopefully, they will all come back with adjusted comparables that are the same style of home as your home. Ask them to write down the highest price they think you should expect, and the lowest price you could expect. Your motivation is a major factor. Every home has a range of value, not an exact price. The question to ask yourselves is whether you want to be homeowners who want to test the market or be the next home to sell when a neighborhood buyer comes along. Take motivation into consideration when entering the market. The market conditions in your neighborhood are another important factor in deciding which price to embrace. Ask each agent to demonstrate whether the market is a buyers, sellers, or a balanced market. You gain the opportunity to test these agents before you engage one of them. Your uncertainty is likely to fade as your new efforts materialize and the best agent to work with will emerge from the contenders.